The Blender Foundation has launched Blender Benchmark, a new hardware benchmarking test based on a range of production-quality scenes, including data from its own open movies. Data generated by the benchmark, which runs on Windows, Linux and macOS, will be collated online on the new Blender Open Data portal, enabling users to see how different CPUs and GPUs perform with Blender. As with other benchmarking tests based on production renderers, like V-Ray Benchmark or the new built-in utility in Redshift, Blender benchmark tests how fast standard test scenes render on a user’s machine. 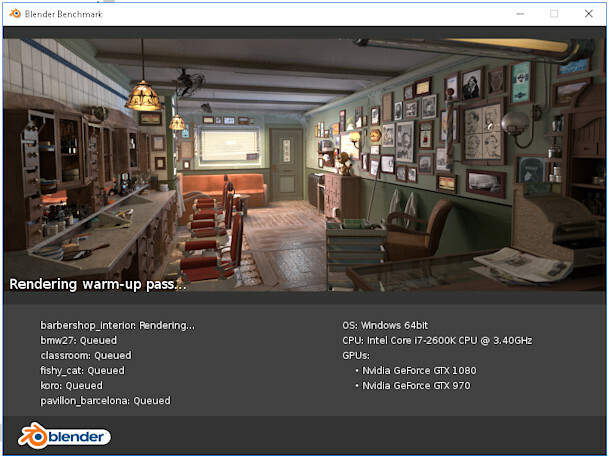 In the case of Blender Benchmark, it’s the six test scenes that the Blender Foundation has been using in its own recent GPU benchmarking. They’re intended to represent a range of real-world use cases, from interior and exterior architectural environments to a set from the Blender Institute’s animated short Agent 327: Operation Barbershop. The benchmark also automatically gathers information about the test machine’s operating system, RAM, graphics cards, and CPU, as well as information about the performance of the system as the test runs. Users can choose to use the resulting data privately, or to share it online via the new Blender Open Data portal, where it will be aggregated with other submitted test results. The aggregated data can then be used to see how well different CPUs and GPUs perform with Blender. The benchmark and portal are currently in public beta, so at the minute, the site only gives a limited top-line summary of the benchmark scores. Amongst CPUs, AMD’s new EPYC 7551 server processor comes out fastest, followed by four Intel Xeons. The GPU data is much more general: you can only see that Blender renders fastest on the GPU using Nvidia’s CUDA API rather than OpenCL, and that rendering on the GPU is faster than using the CPU alone. Visitors will be able to view both the full raw data and verified benchmark scores once Blender Benchmark comes out of beta, which is expected to be in September 2018. Is this the most demanding 3D benchmark test yet?